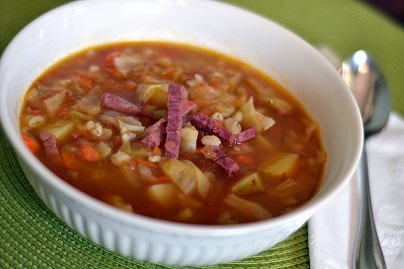 Not a Corned Beef and Cabbage dinner but this Corned Beef Cabbage Soup recipe is a favorite restaurant soup recipe when celebrating Saint Patricks Day and for whenever there is corned beef available, and the corned beef broth from cooking it. 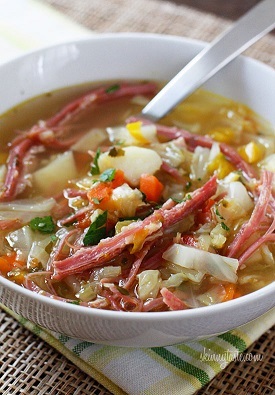 The recipe requires the corned beef broth to turn out properly. There really is no good substitution for that broth. 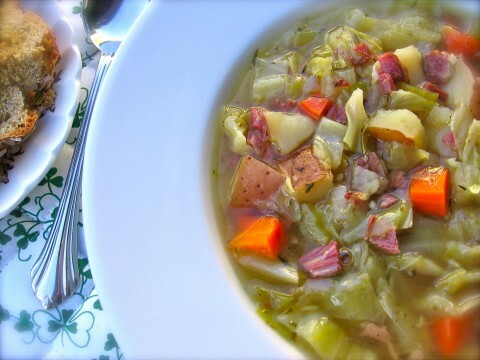 Corned beef is really not a traditional Irish dish, but many of us in North America have adopted it as a meal to serve in honor of the Irish, the Irish spirit and Saint Patrick. The Irish "forgive us," of course, and our tradition continues unabated. Besides, a great many of us really like corned beef, so it gives us an excuse to serve it. So whether you are preparing this delicious soup with leftovers or because you simply like the idea of making the soup, enjoy the recipe. Preparation time: 20 minutes. Serves 3-4.